The Bradbury Thompson Alumni Center is one of the marquee buildings on campus and a space in which alumni can take pride. The building houses the Alumni Association staff, additional office space for University units and meeting space for Alumni Association, campus and community events. The Bradbury Thompson Alumni Center is off 17th and Jewell, across the street from White Concert Hall and Mulvane Art Museum. As you enter from the east, the Joss Reception Gallery is illuminated by natural light from skylights. A custom-made staircase leads to the upper level where University offices are located. The Washburn College Bible Room displays the last edition of the Washburn College Bible. The Ruth Garvey Fink Convocation Hall, a 3,420-square-foot room with a fireplace and large windows, serves as one of the premier event spaces on campus. Outside the hall is the 16,500-square-foot Doris Firestone Joss Garden, featuring a brick sidewalk that forms a “W,” as well as a 5-foot-11 bronze Ichabod statue. Discussions for an alumni gathering place stretch to the 1960s in the aftermath of the Topeka tornado, and ideas were presented for an alumni convocation center in the early 1980s. 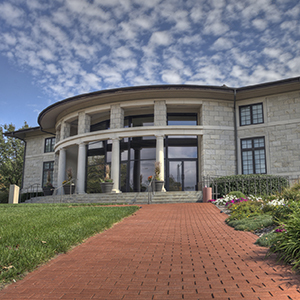 After more than a decade of planning and fundraising, the Bradbury Thompson Alumni Center opened in April 1996. The facility is named after Washburn alumnus and renowned graphic designer Bradbury Thompson, ba ‘34 (1911-1995). 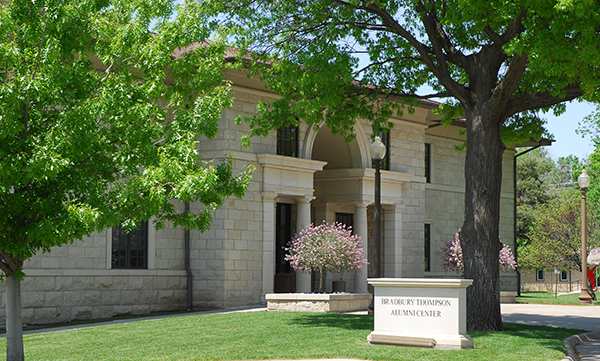 The Bradbury Thompson Alumni Center meets the needs of alumni, the University and the Topeka community. Many rooms within the facility are available to the campus and public for rent. Learn more.